The cutting-edge Holden Volt 2013 with extended range mode will establish an entirely new segment in the Australian market when it launches late in 2012. The five-door, four-passenger Volt is designed to provide the benefits of an electric vehicle without the range limitations usually associated with electric vehicles. The cutting-edge Holden Volt electric vehicle with extended range mode will establish an entirely new segment in the Australian market when it launches late in 2012. The five-door, four-passenger Volt is designed to provide the benefits of an electric vehicle without the range limitations usually associated with electric vehicles. “The Holden Volt can be the only car you need to own,” said Mike Devereux, Holden Chairman and Managing Director. 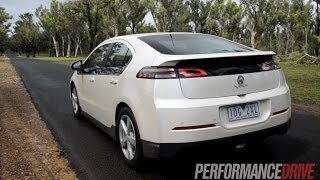 “The Volt is a true game changer for Holden and the entire industry. It promises to revolutionise the way people view electric vehicles with its world-beating drivetrain, progressive styling and outstanding safety. The Holden Volt is not a hybrid. It is a one-of-a-kind, all-electrically driven vehicle designed and engineered to operate in all climates, with a total range of more than 500 kilometres (depending on conditions). Powered by GM’s revolutionary Voltec propulsion system, it consists of a 16-kWh lithium-ion battery pack and electric drive unit that provide a pure electric range of between 60 and 80 kilometres, depending on conditions. A 1.4 litre petrol-powered engine extends the range by operating the vehicle’s electric drive system until the car can be recharged or refuelled. This distinguishes Volt from other electric-only vehicles, which cannot be operated when recharging is not immediately available – such as during a power interruption or on a long-distance trip. “The Holden Volt makes the electric driving experience as efficient, intuitive, safe and seamless as any vehicle in the market today,” said Richard Marshall, Holden’s Director of Energy, Environment and Technology. Every major element of Volt was designed and analysed for efficiency, including its highly aerodynamic exterior, lightweight wheels, specially designed tyres and more. This attention to detail makes Volt one of the most aerodynamic and energy-efficient vehicles in the market. The heart of the Holden Volt is its Voltec propulsion system, which combines pure electric drive and an efficient, range-extending engine, giving Volt a total range of more than 500 kilometres, depending on conditions. Volt’s long-life battery consists of a 198.1 kilogram T-shaped, 16-kWh lithium-ion battery pack manufactured in Brownstown Township, Michigan. It supplies energy to an advanced, 111-kW electric drive unit to propel the vehicle. Using only the energy stored in the battery, Volt delivers between 60 and 80 kilometres of fuel and tailpipe emissions-free electric driving, depending on conditions. The Volt battery is designed to deliver value, safety, quality, performance, durability and reliability. Since 2007, GM engineers have completed more than 1.5 million kilometres and four million hours of validation testing of Volt battery packs, as well as each pack’s nine modules and 288 prismatic cells. The development, validation and test teams have met thousands of specifications and validated each of the Volt battery’s 161 components, 95 percent of which GM designed and engineered. When the battery energy is depleted, Volt seamlessly transitions to extended-range mode. Power is inverted from a technically advanced, 1.4 litre 63-kW petrol-powered onboard engine to the electric drive unit to provide additional range. Volt proves electric driving can be spirited. The electric drive unit’s excellent low speed torque of 368 Nm ensures Volt never lacks for performance. Charging Volt’s battery is simple and intuitive, and can be done through conventional household electrical outlets. The Holden Volt is completely rechargeable in approximately four hours using a standard powerpoint and the 3kW charging station. Using the standard 1.2kW portable charge chord, a full charge will take approximately 6-10 hours. Once the vehicle is plugged in, owners can schedule either immediate or delayed charges, even coordinating charging according to departure time or when electricity rates are lower. 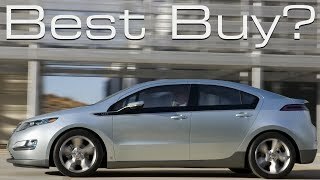 Volt’s bold, sleek, performance-oriented stance conveys its electrically driven capabilities, and looks like an upscale, midsize sport sedan. This is made possible by its wide front and rear tracks (1556 / 1578 mm), 2685 mm wheelbase, wheels-out stance, sculpted belt line and premium execution. Working closely with aerodynamicists in GM’s own wind tunnel to shape the Volt, design and engineering teams developed one of the most aerodynamic vehicles in GM’s history. By reducing the energy needed to overcome air resistance, Volt aerodynamicists contributed an estimated 12.5-km of electric range, and approximately 80-km of extended range. Volt’s MacPherson strut-type suspension, sophisticated compound crank rear axle and quick-reacting, rack-mounted electric power steering system with ZF steering gear – a feature commonly found on premium sport sedans – have been tuned to deliver a smooth, refined ride with responsive handling and solid, on-centre feel. A low centre of gravity combines with the wider track and long wheelbase for balanced performance, and front and rear hydraulic ride bushings, another premium addition, help eliminate road harshness. Volt rides on lightweight aluminium wheels that weigh only 8.1 kilograms each, compared to 11 kilograms for typical 17-inch wheels. Occupant protection continues with a strong structure, and the Holden Volt’s body-frame-integral structure strategically blends advanced steels to help optimise crashworthiness and stiffness. Nearly 80 percent of Volt’s overall structure consists either of high-strength, advanced high-strength or ultra high-strength steel. Active occupant protection features include eight standard air bags and safety belts with dual pretensioners. Because Volt operates so quietly in all-electric mode, a driver-activated feature sounds a noise to alert pedestrians, particularly those with visual impairments at an intersection.